Marisa Boyd’s practice emanates in multiple directions from her central practice: the creation of shapes and texture through physical gestures and/or blind contour drawing. 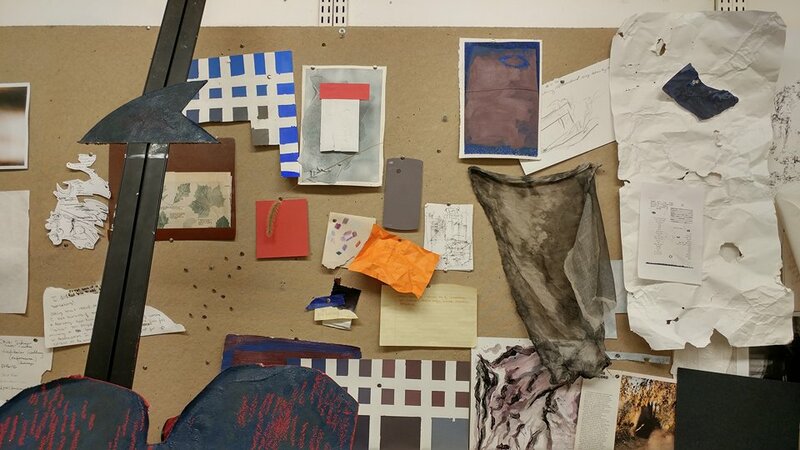 Her studio is strewn with strange, beguiling, gesture-scrawled drawings (many in monochrome or earth-tone colors) and items which suggest similar movements and shapes. Her unique shapes are mostly created with paper and pen or pencil, then enlarged and transferred to other media, including oil-painted canvas or MDF, or cut out from thin board which is then painted, scraped, marked or otherwise distressed. She experiments constantly with materials so the configurations are prone to changing. For example, a vein of work she is pursuing has to do with the biting of paper, which creates specific indentations and shapes in the teeth-torn paper. The constant among these pursuits is an interplay between material texture and fascination with the identity of shapes. Having her eyes closed while producing the shape-gesture drawings, she is operating from spontaneous bodily impulse and chance. It's improvisational and immediate. She is attuned to subtleties of texture and shape, and intuitively seeks to connect her body to the drama of surface grain, grooves and contours. The blind drawing aspect of her practice appears to fulfill some portion of this need for direct connection, as she is able to feel shapes through the movements of her utensils across the paper. The experienced movement and resulting shape work together to generate information used to create larger pieces cut from wood or rendered on canvas or assemblage. The work with biting also fulfills the impulse for direct and deeper connection to the rendered shape. She regards the small drawings she uses to source shapes and gestures from as more significant than the larger works done in wood or canvas, as they are veritably the parents of any larger works. Being pulled from the small blind drawings, there is less of a chance quotient in the larger pieces. The more calculated nature of the larger pieces is made up for by other intuitive, spontaneous actions such as scraping, stabbing, tearing or other methods. These methods of injecting spontaneity are all notably related to bodily movements. She works a little bit every day, aiming for three hours. Other than the aforementioned practices of extrapolating bodily movements into larger works, this consistency is the other central aspect of her creation habits. She is continually pushing toward the most effective implementation and combination of these methods. Without this constant pressure she would find it very hard to get to the bottom of her fascination with the physical experiences and the imprints she records in her work. She seems to always be trying new approaches and combinations of approach to gauge their impact on both herself and her audience. When discussing a highly textured monochrome piece done in whites and grays, built out of a stretched canvas with smaller different-sized distressed scraps of canvas, she refers to the piece as “quiet” despite its rampant texture. Biting or moving the body is a quiet activity, but can be felt with great intensity, especially when great attention is paid to the experience. The experience of Marisa's work (as I perceived it during my visit) is internal and intuitive. It is something to be read into, contemplated and felt--not something that aggressively proclaims itself or forces itself onto the viewer. In that way, it’s absolutely correct to refer to her work in general as “quiet.” In terms of texture though, it tends to explode with detail from all angles. The tiny indentations, scratches, and other markings, to me, evoke thoughts of histories somehow contained in or described by these works; past events, travels, spans of time. Marisa’s works display textures in ways that remind of the way cherished artifacts build up dust and scratches. The markings bring me to think of where something might have been, who might have owned it, what it has or hasn’t been through. She discusses at one point her complicated feelings toward using paint, as paint tends to be made using synthetic materials and pigments. She is using oil paints at present to mitigate the “fake”-ness of paints containing plastics or other manufactured chemical ingredients. To Boyd, the naturalness of surfaces and ingredients in rendered works is, to some extent, equivalent to honesty. This makes sense in relation to the way she generates and applies shape and texture; there is as little mediation as possible. The immediacy of her mark-making echoes the immediacy--the naturalness or honesty--she desires in materials. Speculating on what post-graduation life as an artist-at-large will be like, she says she will be consistently applying to shows and residencies in order to push herself to keep making. Submission deadlines will serve as due dates for her to keep producing new work. She also mentions that it’s extremely hard to make anything truly new or unique, and the desire to achieve something on that order pushes her to keep moving forward in her work. High personal standards also inspire her to keep working hard to develop ideas and techniques. She speaks of being uncomfortable with her work due to the various imperfections she perceives in finished projects. With continued effort she seeks to diminish this discomfort as she refines her practice.